As shown above, the Kylo Ren Pig;s body consists mostly of his mask. SMALL MOVIE SPOILER AHEAD: Since Han Solo and Leia Organa are his parents, and they are both birds in the game, he would also be a bird underneath his mask, just like Darth Vader was in the game. Since his parents are yellow and pink, he would theoretically be an orange bird underneath, slightly shaped like a triangle. You can see that under his cloak, the sides of his body are pointed and triangular, a small reference that I put in. He has fake metal ears on top. I copied most of his mask from a picture that I found of it online. The bottom bit has two nostrils, and it is supposed to look like a pig snout. If you look closely, you will see that the eye hold resembles Angry Bird eyes. The eyes underneath are semicircles far apart, just like Han Solo Bird's eyes. He is wearing a black hood, with two ear holes. His lightsaber is very small in size, just like all of the weapons in the Angry Birds Star Wars game are shrunk to fit the size of less than the character that uses the weapon. I copied the hilt and removed a few details, just to make it look very simple, so it could look like it belongs in the game. The blades are very thick (also from the games) and have a dark red outline and light red insides. On the name below Kylo, I put quotation marks around the word "pig", since he technically isn't a pig under his mask. As shown above, Rey is a pink-colored bird. Unlike the other drawings, her outlines of the shapes are close to the color of the inside (something I noticed while looking at pictures of Princess Leia and Padme birds from the game). Her beak is small and triangular at the top, so the main bit is shaped like roughly like a diamond. Her eyes are hazelish-green if you look close enough (just like in the movie), and her hairstyle consists of three buns in different shapes. Her hair has different shades of brown, just like Princess Leia Bird has shading and texture on her hair in the game. She has thin brown eyebrows, and I added eyelashes to show that she was a girl. Her clothing has a brownish-grey undershirt, and gray wraps around the chest. She is wearing a brown belt consisting of two parts. She also has a small grey collar at the top. The staff is almost completely symmetrical from top to bottom. I looked at a picture of it, and it ahs many small details that I wouldn't be able to fit on the small version, so I took out some details to make it simple as possible. In order to make the outlines on the inside of the staff stand out, I colored it in very dark grey, so it is different from the black outline, but looks very similar in color. 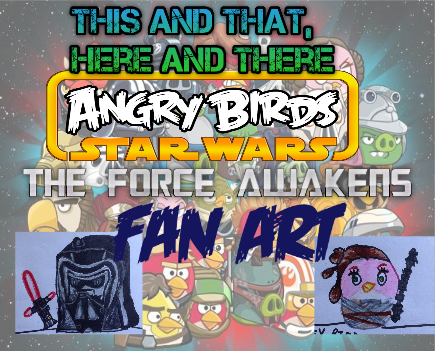 It is right next to Rey's body, slightly hovering above the ground, just like with all of the characters hold their weapons in the two Angry Birds Star Wars games. I hope you enjoyed. Thanks for reading this. Stay tuned for my second post later on today, and two posts every day of the summer. I will see you next time. BBYYYYEEEEEEEEEE!!! !